1. People are putting butter in their coffee. WHY? (Editor’s note: these people totally all live in LA). The Short Answer: The theory is butter’s high-fat content will slow the time it takes for your body to metabolize the coffee’s caffeine and give you more energy. 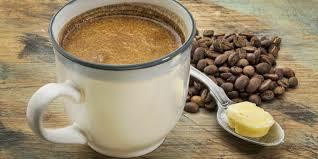 This is dubbed “bulletproof coffee” and you’re meant to use organic, grass-fed, free-range happy butter or ghee. More information here. The Short Answer: As per HuffPo: It’s exactly what it sounds like: “broth made by boiling poultry, beef or fish bones until they break down. They can be boiled for as little as four hours or as long as 48.” The bones have collagen and other elements that are meant to make your hair shiny and your skin glow. The gelatin in the bones is meant to soothe digestive issues. The Washington Post digs in here on all of the benefits of a bone soup diet. 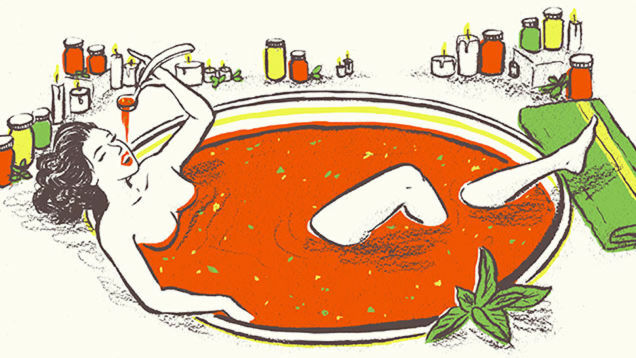 A writer at Jezebel did a soup cleanse and documented it here. Has anyone tried any of these? Or anything like this? I did a one-day juice cleanse, once. PS I am heading to the Berkshires this weekend for a yoga retreat! See ya Monday! This is the first time I hear that someone would put butter in their coffee. Haha! People do all sorts of crazy things… Hmm!! Agreed! Though now I do wonder what it tastes like. Is it that different from cream? I guess it will taste creamy… I will test it on the boyfriend (he puts cream in his coffee) so we shall see if he notices 🙂 Haha! I’ll let you know! let me know what he says!! I don’t eat butter, BUT I have tried a small scoop of coconut oil in my coffee. It was ok…but bizarre. I’m a traditional black coffee drinker, so I didn’t do that twice. What made you think to try that? I had seen it on another blog, and I guess it was supposed to have a similar effect. Although it was also to help people use less creamer in their coffee’s (I guess) because the fattiness of the oil helped with the bite of the coffee. Since I drink mine black anyway…I didn’t need the oil. HA. ahhh ha that makes sense! do you use sugar/truvia/etc? Weird! My brother-in-law swears by #1 (I think he started with butter but now rocks the coconut oil), but I can’t wrap my mind around it. #2 is just full of bizarre-ness. A magazine article I read guessed that one of the next big diet trends would be for protein-rich snacks made from insects. So…a lot to look forward to, I guess. insect snacks! Very paleo. maybe someone will cover them in dark chocolate.